When a new baby is born, sometimes the older sibling can feel a bit left out. Baby gets presents at the hospital, everyone oohs and aahs over him/her, and mama’s attention is now divided! When my second son was born, we held a Big Brother Party for my oldest son so he could introduce his little brother to his friends and we could celebrate his new role. It was a very simple affair, with 4 other toddlers and their parents, but it was a really nice opportunity for us to concentrate on filling our son up with confidence and reassurance that he was still very special to us and that being a big brother was going to be great – even if it didn’t quite feel like it yet. When everyone arrived, they congratulated him on becoming a big brother and he got a morning to play with his favourite friends. Simple yet fulfilling. This time around as we expect Baby #3, we are planning to have another party. It will be much the same, except now each of my boys will get to invite a few friends. 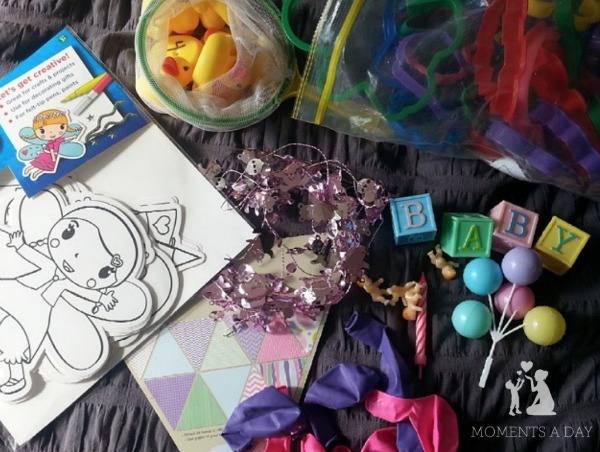 In this article I will share some practical ideas for pulling off a “party” soon after giving birth – it’s really not as hard as one might expect, especially if you prepare ahead of time. This is the sixth instalment of my series Tips for Families Expecting a New Baby. * Choose a date when you have one or two extra helpers (friends or family members) to hold the baby or help you welcome guests in case you are occupied. The day can even be chosen before the birth – I think a month after the due date is ideal. * Send out the day, time (add an ending time so you can feel confident about being in “hostess duty” for no more than, say, 2 hours! ), address, name of the event, and what the party is for. 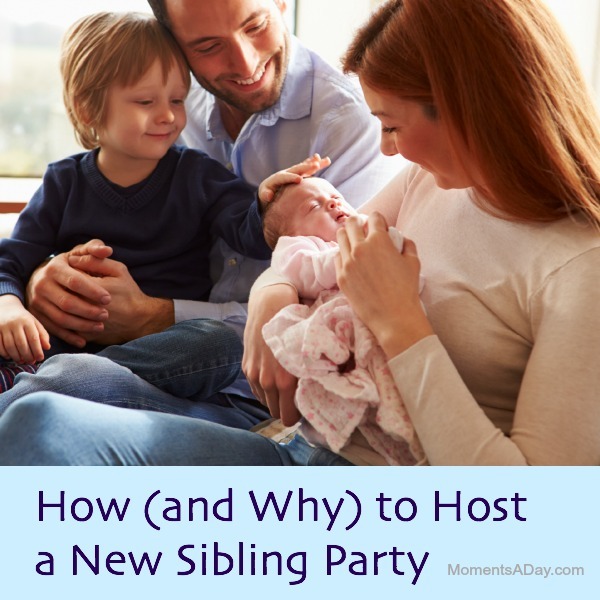 Here are some name ideas for your “new sibling” party: Big Brother Party, Big Sister Party, New Baby Party, Little Brother Party, Little Sister Party, Growing Family Party. Be sure to specify that no gifts are necessary for big siblings or new baby if you think your guests may not be sure… the worst thing for a younger toddler would be seeing their baby sibling getting a lot of gifts at their party! * Refreshments can be very, very simple. You just gave birth – and don’t need to do anything fancy! You can even ask guests to bring a plate of food to share. Chips, watermelon slices, a pack of cookies… if you have it for “morning tea” or “afternoon tea” it is really not too difficult to prepare the food. Just don’t set your expectations too high for this party – you will have plenty of time to entertain in the coming months. * If you want to have a cake, let the older child help decorate – and don’t worry about the final result, just let them have fun! For our first Big Brother Party I taped a photo of the brothers to kebab sticks to stick in the cake which my son really liked. This time I’m going to reuse some cake toppers from my sister’s baby shower (seen in the photo above). I might even buy a cake from the grocery store if I don’t have time to make one – or, better yet, ask my husband to pick one up. * Plan a few simple activities or games based on the kids coming. If you know some like to colour, get some cut out shapes from the dollar store or print a few colouring pages you think they would like. Playdough is another easy activity (and a chance to take out all those cookie cutters!) – I’m planning to make several batches with glitter to make it a bit more special. I’m also going to have one game where the kids fish ducks out of a bucket with a net, and get a challenge corresponding to the number on the bottom of the duck. A list of challenges with their numbers will be set beside the bucket (i.e. do 10 jumping jacks, say something kind to a friend, jump as high as you can, etc). * Have just one or two decorations to make it feel like a “party” but reduce after-event cleaning. I got some paper bunting and I am also going to blow up some balloons (which will double as toys for our guests). Super simple. * Have a table or wall dedicated to displaying photos of “big sibling milestones” (finding out we were pregnant, belly kissing, first meeting in hospital, etc). You could also show photos via a slideshow on the computer. * If your older sibling does not mind being the centre of attention, it can be fun to sing “Happy Brother Day” (or “Happy Sister Day”) to the tune of “Happy Birthday.” Just keep your child’s temperament in mind. If they would enjoy this, great. If not, just leave it out of the schedule. The event should be about them so there’s no reason to do something that would make them feel uncomfortable. * Choose a time (like before you cut the cake) to say a few words about the purpose of the party. We thanked everyone for coming and told our son how proud we were of him for welcoming the new baby into the family and how we were looking forward to all the memories we would now share as a family of four. Just a few words to set the tone and let your “big sibling” know that you appreciate their hard work adjusting to the changes and that there are many fun times to come. * I like to have a little activity for parents who attend our parties to thank them for coming. I generally fill a jar with chocolate covered nuts or other candies and offer cut up pieces of paper and a pen, with instructions for guests to write their name and “guess” (for how many candies are in the jar) on the paper. They place their paper folded into an empty bowl. At the end of the party, the winner is announced and gets to take the jar of goodies home. * As another kind gesture to the parents, it is nice to take photographs of each mother/parent with their child (or children). Mothers rarely get in photos with their own kids, so it’s great to have an opportunity to capture them together! Then be sure to email or text the pictures straight away so they don’t get forgotten about! Have you hosted a Big Sibling Party before? Please share any tips or activities! This post is part of my series Tips for Families Expecting a New Baby. For more ideas about getting yourself and your family ready for your new bundle of joy, check it out.